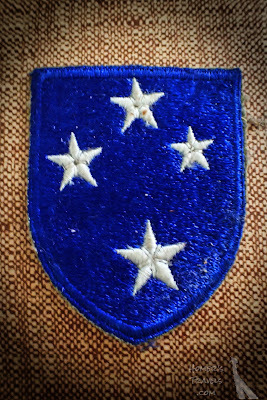 A patch from my Father's Military uniform. Today is Memorial day in the United States. It is officially a day to remember those in the armed services who have given their lives for their country and our freedom. I consider it a day to remember all who have gone before us - they have shaped us just as much as the fallen veterans. On Saturday Mom and I visited the graves of my Grandparents, Father, and Brother among other family members. My Father's grave had a flag for his service as a Military Policeman during the Korean War. We left flowers in the rain and paid our respects. Take time to remember today. 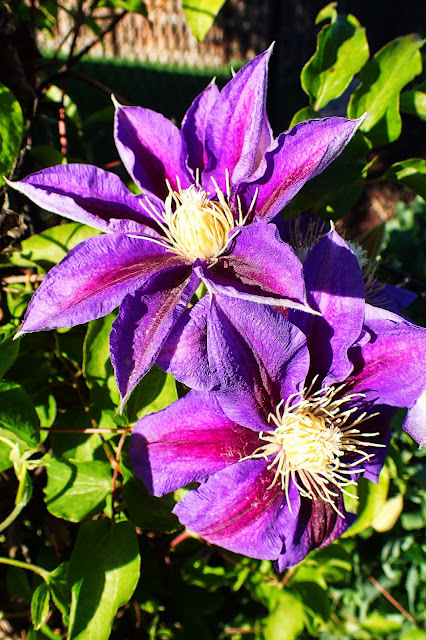 Yesterday after visiting the cemeteries and having lunch with my Aunt and Uncle, as we were passing the local botanical gardens, Mom mentioned that she heard about a foul smelling flower that was about to bloom at Lauritzen Gardens. It turns out that the Titan Arum at the gardens (I didn't know that had one) bloomed that evening. This morning we got up early and went to see and smell the so-called Corpse Flower. Even at 7:00AM on a Sunday the line was about thirty minutes long (two and a half hours long as we were leaving). The flower blooms infrequently, often two to ten years between blooms. Lauritzen Gardens has had theirs, they named her the Amazing Stinko, for several years. 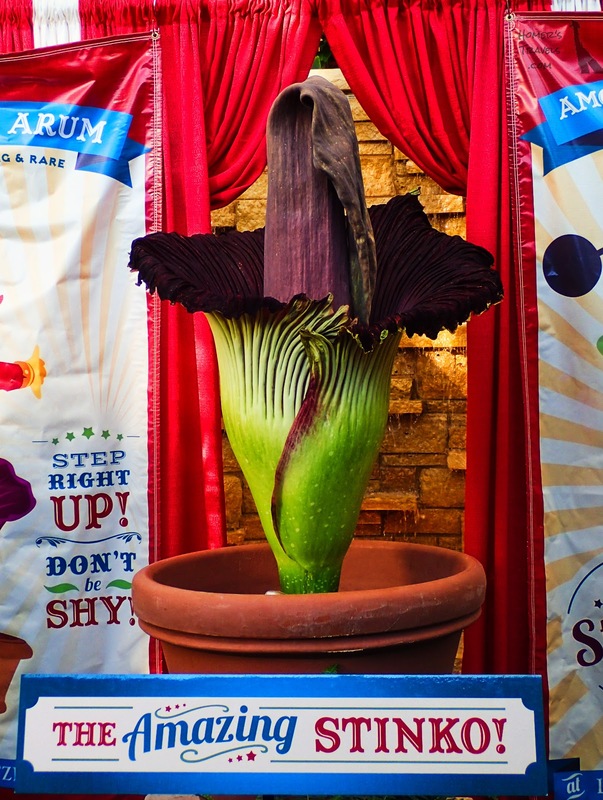 The claim to fame of this large bloom is that it smells like rotting meat. Titan Arum - the corpse flower. The flower bloomed last night (to the delight of the Wedding party that was at the park). The spadix (the cone shaped part of the flower) collapsed around 2:45AM and the bloom will probably be done in twenty-four to forty-eight hours. The smell really wasn't that bad but there was a hint of rotting meat in the air. 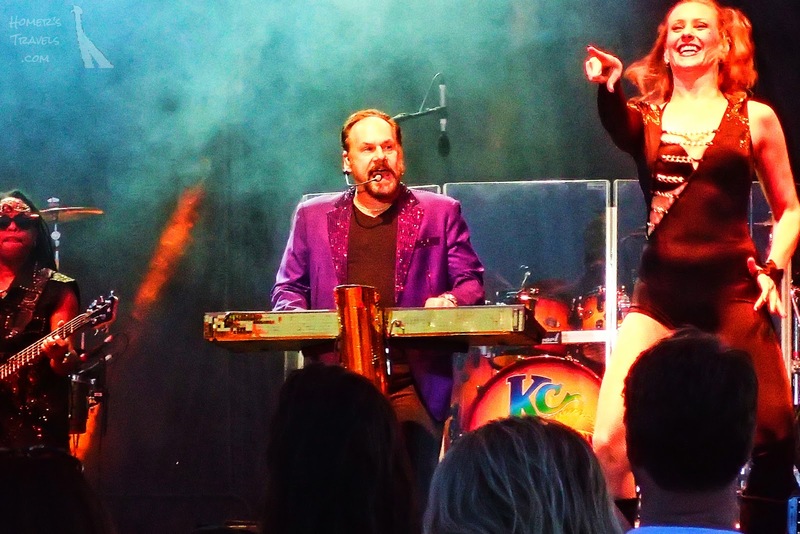 Music: KC And The Sunshine Band With Bluffett At Loessfest. On Friday the Wife and I went to the opening of the 5th year of Loessfest. The opening acts were Bluffett (a Jimmy Buffett tribute band) and KC and the Sunshine Band. One of the KC and the Sunshine Band dancers. We started off with VIP parking and seating courtesy of the Brother-in-Law. This landed us in the second row with a great view of the stage. Along with the great location, our seats also was shaded from the setting sun preventing blindness. The show started with Bluffett, a Jimmy Buffett tribute band. I'm not a big Buffett fan so I wasn't familiar with most of the band's set but I liked the songs I did recognize. The band we really were interested hearing was KC and the Sunshine Band. When he came out and started singing songs I remembered from my youth I was happy but that feeling didn't last. For one his singing voice, in my opinion, didn't age well. For another he apparently didn't have enough of his own music to perform so he covered other songs that he liked. I'm usually okay with a cover but I prefer to limit covers to one per concert. I am there to her his music, not someone else's. He also twirled too much for a man his age. The dancers were new to me - I've never seen a show with onstage dancers before. KC and one of his dancers. I did enjoy some of the concert. I don't think I was in the right mood really (I'd been having a random off-the-trail bout of remorse most of the afternoon). I've been to worse and, I hope, will see even better concerts later this summer. Some pictures can be found in my 2017-05-26 KC & The Sunshine Band With Bluffett Concert, Tom Hanafan River's Edge Park, Council Bluffs, IA Google Photos album. Another May flower. 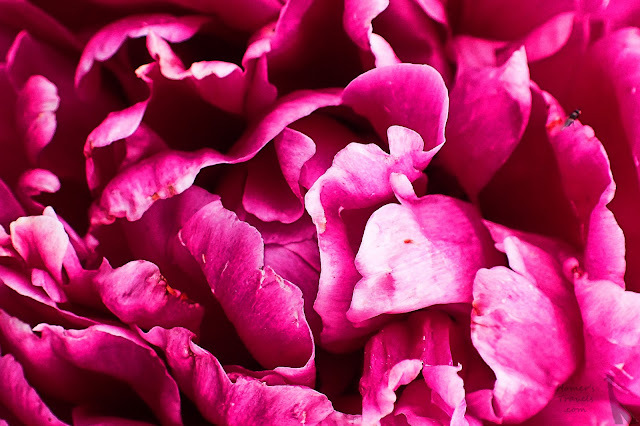 This one a close up of a garden peony. Can you find the photobombing bug? For my third book of the year, I chose the second book of the Themis Files, Sylvain Neuvel's "Waking Gods". The book is written in the same memoir style as the first book "Sleeping Giants". The story is told through transcripts and journal entires. The machine, a huge robot christened Themis after the titan, has been assembled which has attracted the attention of the alien creators. The action is paced well and what I thought were major characters lost their lives, a surprise as I read. Unfortunately, two of the characters who died were also my favorite. Oh well. I enjoyed this chapter of the Themis Files and I look forward to the next ... yes, the book ends with a classic cliffhanger. I gave the book four stars on Goodreads as it kept me interested and wondering what would happen next. An insect inspecting another May flower in our backyard. 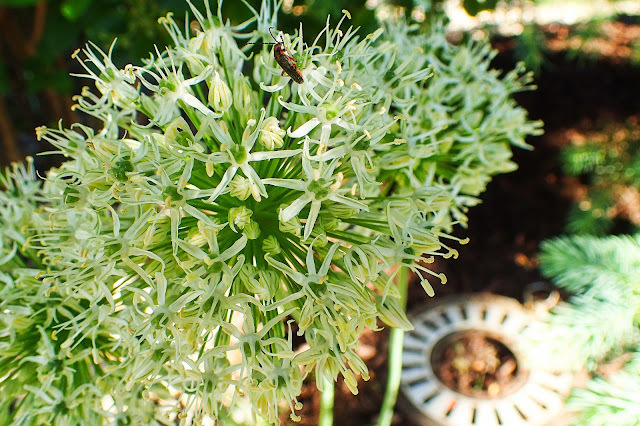 In this case, the flower is allium. It seems like it's getting harder to find non-fiction books that interest me. The crop of non-fiction books are either retreads of subjects I've already read or are biased one way or the other. So for my next read, I selected a field that I haven't really given much thought to ... the psychology of thought. Specifically, what we can learn about thought from the voices in our head. The book is Charles Fernyhough's "The Voices Within". We all talk to ourselves, silently or out loud. I know I do ... a lot. I hope to learn something from this book but I have to say that there wasn't much in this book that I didn't know already. Oh, there were a few little tidbits here and there that were new to me but all in all, there really wasn't much of a revelation in the book. If there is a revelation it's that there is very little known and very little consensus about what we do know about the voices in our head. I gave this book three stars out of five on Goodreads. I was expecting more than what I got. Today is the sixth anniversary of the start of my first Camino. This was the view at 8:27 am soon after I left Saint-Jean-Pied-de-Port, France. The start of my first Camino. 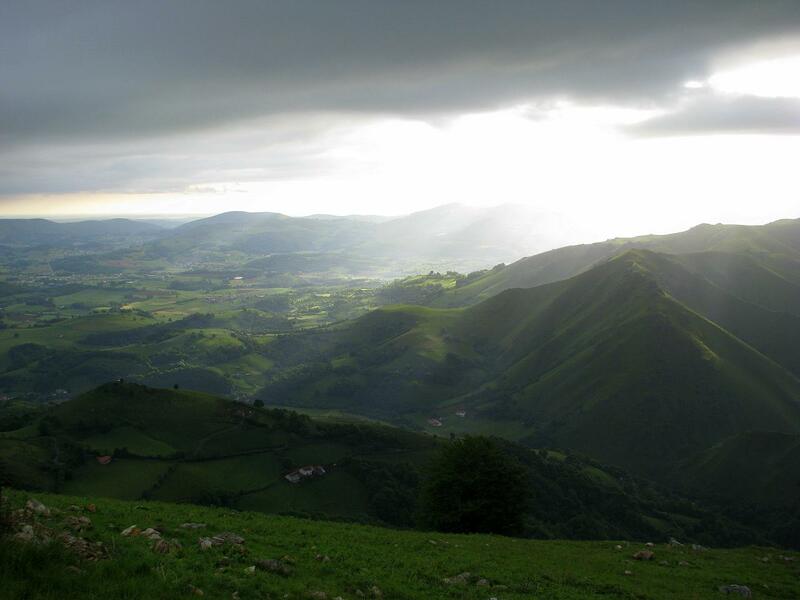 It was the first of many beautiful vistas along the way to spiritual healing along the Camino. It's been a beautiful May so far and the May flowers are blooming. 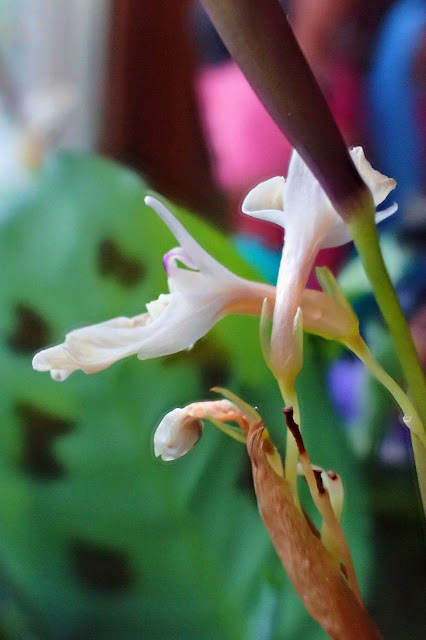 This is a close up of a rather tiny flower on the window sill of our guest room. "A Small Flower Up Close"
Last night I went to see Jerry Seinfeld at the Orpheum Theater in downtown Omaha. Seinfeld had come through Omaha a few years ago and I'd not taken the time to see him then so when I saw he was coming back, and I was back in Omaha, I bought a ticket (The Wife was not interested in going). I had a pretty good seat though there really aren't any bad seats in the Orpheum. Once again I should have had a camera with me since there was very little security and no metal detectors so bringing a camera in wouldn't have been an issue. From my seat, I would have gotten great pictures. The show started fairly promptly with the warm-up comedian Mark Schiff. It took me a while to warm up to him but I did start smiling by the time his twenty-minute set was over - I'm pretty tough to impress when it comes to comedy. After a short five minute transition (it may have been shorter) Seinfeld came out and for the next hour or so he went from funny to hilarious. I really enjoyed his comedy and his delivery. He was very folksy with the crowd and It felt like sitting around with a funny friend. I was laughing out loud. He was fun and I'm happy I went. Well, since my schedule unexpectedly opened up, I've been busy filling my summer. It started yesterday with a movie. Namely, "Guardians of the Galaxy Vol 2". Other movies I will be seeing in IMAX later in the year include "Spider-Man: Homecoming" and "Thor: Ragnarok". As you can see my movie viewing has a strong Marvel theme. Tomorrow I will be going to see Jerry Seinfeld. I expect to laugh a bit. Then comes the music. In May it's KC and the Sunshine Band at Loessfest. In July we have Queen w/Adam Lambert, Blondie w/Garbage, and Sir Paul McCartney. In September I go see the Cranberries. It's been a while since I saw this many concerts in a year. Six years in fact. In between, there will be several short activities including the Brownville Flea Market, British Fest, Family outings, Birthdays, and Anniversaries (twenty years!!!) among many others I imagine. Who knows, I may even start walking again. My tablet, a Nexus 7, turned four years old last November. In computer and gadget terms, four years old is ancient. Over these years apps have become more demanding of the hardware and my Nexus has slowed down to a crawl. Things it could do when I first bought it will now take forever, or worse, crash. It was time to upgrade. My choice of upgrade was an Acer Chromebook R 11. The laptop/tablet/convertible is faster than my Nexus, has a much larger (11.6") display, and a physical keyboard. The keyboard can be folded back to convert it to a tablet. The screen is, naturally, a touchscreen. I find myself alternating between using the keyboard touchpad and touching the screen - I like that flexibility. It was also cheaper than my original Nexus. So far ... I love it. My intention when I bought it was it to be a replacement for both my Nexus and my desktop. The past week or so of playing with it has shown I've met my goal by about 85% - 90%. The Chromebook is essentially a front end to the internet. If you want to do something you have to have a website or in the case of this Chromebook an Android app, that will do it. So far I have only run into a couple things that the Chromebook can't do. I was unable to find an app to geotag my Appalachian Trail photos using my GPS generated GPX file. I had to use the Geosetter program on the desktop. Also, the scanner app for my printer/scanner could not find the scanner on my network. Fortunately, there is a multi-step workaround to use the scanner. That is what I am finding out. To do things it often takes a two or three step process on the Chromebook to do what takes a single step on the desktop. This is more a matter of getting used to how things work on the Chromebook than anything else. I'm sure I will find more things that I cannot do on the Chromebook but I'm also sure more apps will be written to fill some of the gaps as well. And what of my Nexus? I've removed most of the bloated apps that slowed it down and now has mostly reader apps. I've relegated it to being an e-book reader. Doves have been visiting our backyard for years. Their return each spring is always a welcoming sign. 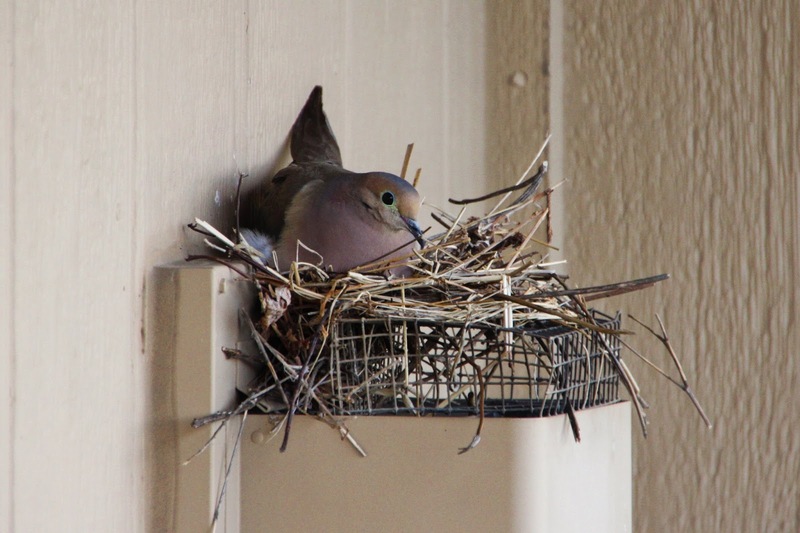 The doves have built a nest on the vent of our gas fireplace (turned off for the season). Looking forward to a new generation flitting around the backyard. "Little doves in our future"